A copy of the first comic to feature caped hero Superman has been sold on the internet for $1m (£646,000). The 1938 edition of Action Comics No 1 - which originally sold for 10c - was sold by a private seller to a private buyer, neither of whom was named. Stephen Fishler, co-owner of the US auction website Comic Connect, said it was "the Holy Grail of comic books". The sale smashes the previous record price for a comic book of $317,200 (£205,000) in 2009. That was also a copy of Action Comics No 1, but in poorer condition. Mr Fishler said the transaction happened minutes after the issue was put on sale at around 1030 local time (1530 GMT) on Monday. He said that the seller was a "well-known individual" in New York with a pedigree collection, and that the buyer was a known customer who had previously bought an Action Comics No 1. "The opportunity to buy an un-restored, high-grade Action One comes along once every two decades. It's certainly a milestone," said Mr Fishler. He added: "It is still a little stunning to see a comic book and $1m in the same sentence." About 100 copies of Action Comics No 1 remain in existence and only two of those have a grading of 8.0 - very fine - including the one sold on Monday. The previous record-holder had a grading of 6.0. 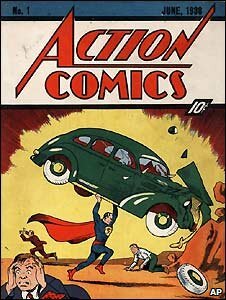 The cover of the rare issue pictures Superman lifting a car over his head.